A while back Nick Knite asked me to create a custom for his MechaBunny. But the Mecha6 are made by a all-star papertoy team: Scott Schaller, Shin Tanaka, Tougui, Castleforte, Marshall Alexander and ME. By accident… well Methuup da Funky One a NPT member found the MOD:1 CTRL and build it. I love this model as a vinyl, how can you not like it as a papertoy! Visit SuperModifiedstudios and click on MODiGAMI and there they are! Do you see the Grumm in there? He should stop calling it a Grumm custom and give it his own name. Perhaps this started as a Grumm, but this is completely different DNA. I’m a member of Nice Paper Toys, well I’m also one of the four Featured Members of NPT. Brian Castelforte aka “NiceBunny” (Brian) Castleforte (aka “no longer NiceBunny”) started this social network for papertoy designers and it’s still growing. We now close to a 1000 members. Time to celebrate? Yes, I personally didn’t think we would get this much members, but I’m glad that I was wrong. But Nicebunny Castleforte want more, more people should know about papertoys, and I agree. And as a good “featured member”, I will use my blog to spread the word once again. But what is it? What is NPT (Nice Paper Toys)? NPT is the only papertoy network. You can show your papertoy creations. Collaborate with other artist, share you thoughts and ideas. It’s all nice, warm, fuzzy feelings, but I like it. It a place that keeps you wanna make better stuff, become a better artist. One of my most popular post is about how to create papertoys (How to create your own papercraft). It seems that a lot of people are interested in papertoys and how to make themselves. On Nice paper toys (NPT) this question pops up now and again on the forum. You can buy a book about it, if you want to know more about it: Urban paper toys (well you should buy this book anyhow because I’m in it 🙂 ). But besides my post about this subject you’re on your own…..
Well perhaps not for long! I’ve been playing with this idea for a while now of making a tutorial series about papertoy and how you can make one yourself. That got me thinking…. It seems that people really enjoy making/creating papertoys, so why not make a book about it? …… hmmm a book, I have never thought about writing a book (grammar is not really my thing, not in English and not in my native tongue), I never wrote a book or designed one (well… not recently). I want to make a “book” about creating/designing Urban Paper toys. But I’m a internet designer/developer, I have no experience with book design, no experience with writing a book and no idea how to do it. It doesn’t matter, I have my blog. I can write and rewrite as much as I want. And I have something that a conventional writer doesn’t have: User generated feedback….. (no idea what that means? It’s you giving me comments/advice/whatever and helping me write this “book” by giving comments). I say “book” because you don’t really need the book, because you can read it on my blog. But for the less internet savy peeps I can create a download link for a e-book or a you can buy a book. I have searched for options to Self Publish and I found a couple, but these two sites seem to popup the most: lulu.com/ and booksurge.com/. But before I can think about that, I need to write about papertoys and how they are made. So this week I’m focusing on how I will do this on my blog. I’ve done this also, but by printing the blank Grumm template on a comic or stationary paper. The only sad thing is that there are no templates to download. I’m one step closer filling the 6 slots for Pusher Series 1 (Designers on Drukks). An awesome design. And I love the extras Scott designed for Dr. Bear, especial the brain case.. Always wanted a evil Doctor in my papertoys collection. Some other nice-to�know information: Scott is a Graphic Design Teacher, which isn’t that special: a lot of papertoy designers have a creative job or education. No, besides teaching Graphic Design, Scott is also in charge of an after school program: F studio. As a design teacher, I often throw in a lot of hand skills oriented components to the projects I assign. The computer plays a big part in all of our projects, but the finishing of a project, whether it is binding a box or constructing a packaging comp, is the part that makes the project complete. Paper toy crafting just seems to be a natural next step, combining design and illustration, hand skills, and toy making. How cool it that!!! I’m trying to figure this stuff out in my spare time and here is a teacher who can teach you everything you ever wanted to know. Man I’m jealous. Visit Cabrillo Design Lab for more info. Check this out: Custom self portraits by students of Scott (and himself) based upon boxy from Shin Tanaka. Nick Knite creator of SIZZA honored me with his second custom ever! He created Speed Racurr who joins the Pusher team. Visit Nick’s website and download another Speed Racurr who is racing for another team! Scott Carrington aka Dr Shazam created something with a skull (I love skulls!!). This one is buried 6-feet deep: Dead Drukk. This image is not doing justice, the two parts of Drukk are too nice not to show… you gotta see for yourself, build the bugger! Do you feel inspired by this model and the custom designs in the Pusher Series? Create your own Drukk, send it to me, and be part of the first �Pusher Series�. I’ve haven’t got any questions yet, so I made one up… But you see I’ve reserved a place for all your questions… Just ask me!! Is it Drukk or Drukks? 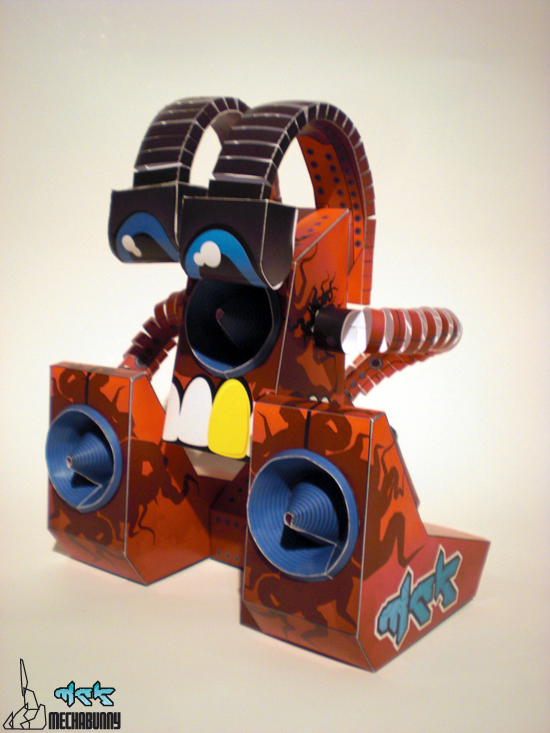 It’s a social network for papertoy designers, and papertoys, visit nicepapertoys.com.